It isn’t officially winter for another month, but with our temperatures dropping at night, this is a good time to do some preventative maintenance on your home. A little work now could save you time, money and frustration later. 1) Have your furnace serviced or at least check it for leaks and replace the furnace filters. 2) Perform a test for carbon monoxide. CO detectors start as low as $20, well worth the expense to ensure your family’s safety. 3) Identify air leaks around doors and windows. Add insulation or caulk where needed. 4) If your home has a crawl space, make sure exposed pipes are well insulated. 5) Install a programmable thermostat to regulate the temperature of your home and to save on energy bills. 7) For safety purposes, replace flashlight and smoke alarm batteries and inspect fire extinguishers to be sure everything works as it should. Flashlights and fire extinguishers should be conveniently located, so everyone in the household knows where to find them. 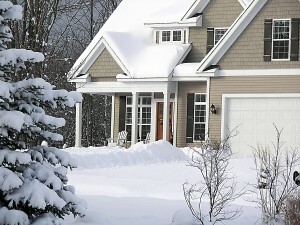 1) Clean out gutters and downspouts to remove leaves and other debris that may trap ice and snow. 2) Replace cracked or damaged shingles before the weather gets too cold and damp. 3) Disconnect garden hoses, cover outdoor water faucets, bring in or turn concrete bird baths upside down. and store patio furniture in your shed or garage. 4) Turn off and drain any exterior water. 5) Prepare your lawn by removing any large leaves and debris, then mulching and aerating it. 6) If you have a fireplace, store the firewood at least 30 feet away from your home. It should be stored off the ground, to keep it dry and insect-free. For more winter home maintenance tips, visit Home Depot online.